The European-size commemorative poster features an image originally developed for the GDC Environs National design conference that has since been adopted as a marketing symbol for the GDC. The linked bungee jumpers represent the umbilical cord-type relationship between designers and their clients. It also symbolizes the connectivity of designers across Canada through the GDC. 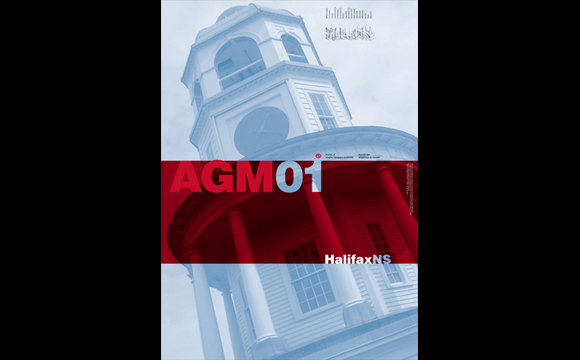 Halifax and the Atlantic Chapter hosted the 2001 National AGM, ten years after we had last visited this easternmost Chapter in Canada. The Citadel, found in the middle of Halifax seemed an appropriate symbol for this meeting, a beacon for GDC representatives to light their way for the upcoming year. This poster was designed and produced as a souvenir of the 2002 Annual General Meeting held in Banff, Alberta May 2–3, 2002 by the National Executive and Council of the Society of Graphic Designers of Canada and the Chapter, Member Association and SDGQ representatives. The GDC logo is created out of a pattern of leaf dingbats from the typeface Cartier, by Carl Dair FGDC. It interacts with a field of male and female designer “dingbats”. Very Freudian. This year’s AGM took place in Ottawa, Ontario, the home of our National Secretariat. 2 Daly is the weathered nameplate on our office’s heritage building, while the exclamation YOW is from the luggage bags destined for Ottawa Airport—coincidentally reflective of the inspirational nature of GDC National AGMs. 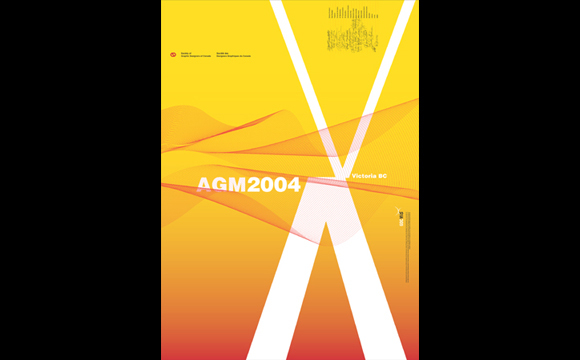 This poster commemorates the 2004 AGM held in Victoria, BC April 28–30, 2004 by the National Council of the Society of Graphic Designers of Canada and the Chapter and SDGQ representatives. The stylized X made out of two Vs (for Vancouver Island and Victoria), acknowledges the Vancouver Island Chapter’s tenth anniversary, while the wave pattern is from the newly redesigned membership certificates and graphically represents the connectivity of designers across Canada through the GDC. 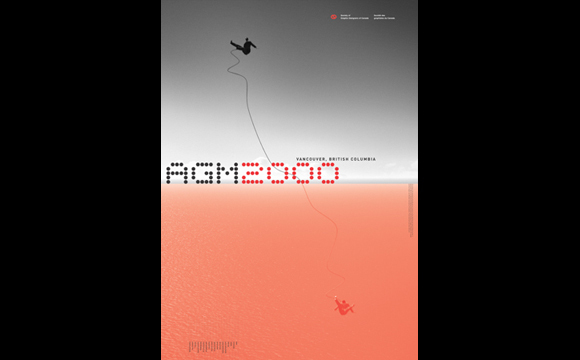 This poster commemorates the 2005 AGM held in Winnipeg, MB May 6–7, 2005 by the National Council of the Society of Graphic Designers of Canada and the Chapter and SDGQ representatives. 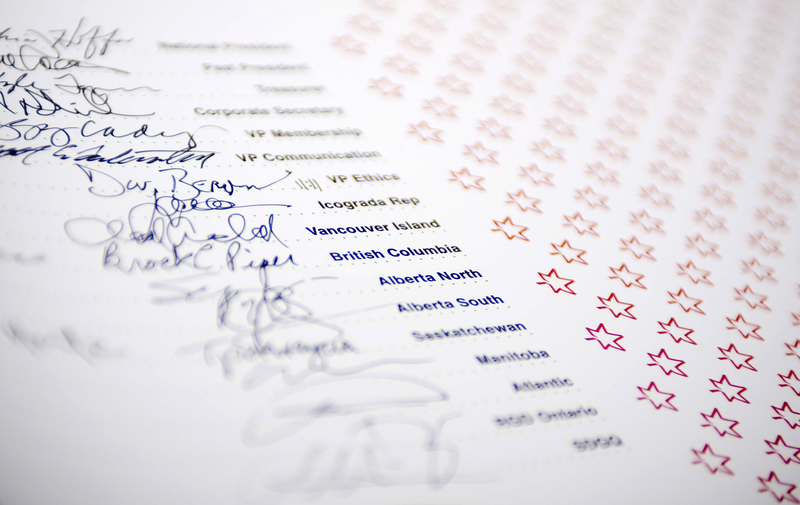 The GDC’s Code of Ethics is one of the many aspects of the Society that helps make it such a unified body of professionals across Canada, and our stance on contests and speculative work was made very public this past year by our vocal opposition to the 2010 logo contest. The relevant section of the Code serves as a backdrop to proportionately sized dots of each chapter across Canada, including SDGQ, which while not a chapter, is closely affiliated with the GDC and attends the national AGM. Ontario is the empty hole in the middle as they chose to no longer be part of the GDC in 2003. 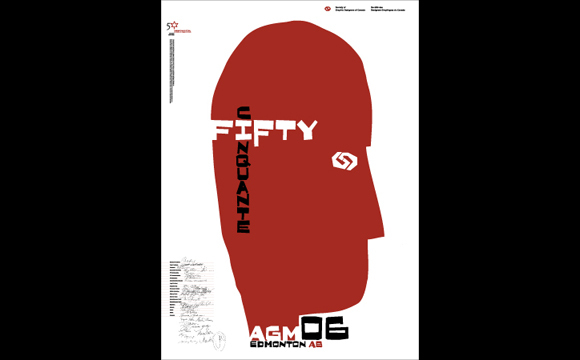 This poster commemorates the 2006 AGM held in Edmonton, AB May 4–6, 2006 by the National Council of the Society of Graphic Designers of Canada and the Chapter, SDGQ and Icograda representatives. 2006 is the 50th anniversary of the founding of the GDC as the Society of Typographic Designers of Canada back in 1956. The poster illustrates the theme that design is first and foremost a thinking process—no matter what the tool employed, be it a pastel crayon or a mouse. The style is meant to be reminiscent of the classic designers of the era like Saul Bass, Paul Rand and Canadian icons such as Carl Dair and Eric Aldwinckle. 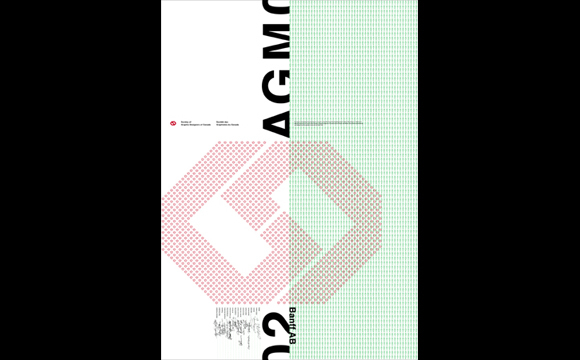 This poster commemorates the 2010 AGM held in Vancouver, BC April 23-25, 2010 by the National Council of the Society of Graphic Designers of Canada and the Chapter, SDGQ and Icograda representatives. 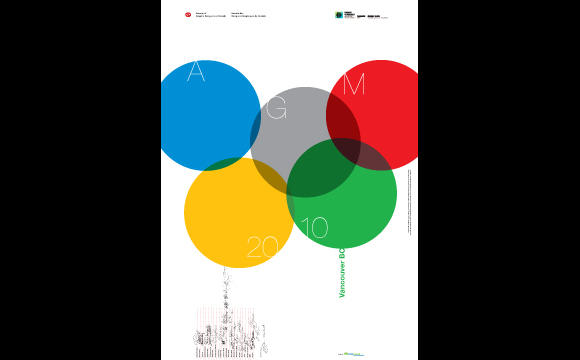 The 2010 meeting kicked off Icograda Design Week Vancouver and followed the Olympic games which were held in Vancouver/Whistler in February, hence the graphic imagery on the poster. Are those celebratory balloons or…?